Professor, Division of Physics, Graduate School of Science, Hokkaido University. In recent years, there has been active development of high-density magnetic recording media, such as magnetic and magnetooptic discs; high-performance magnetic heads; new, high-density magnetic recording formats, such as perpendicular magnetic recording; and new electronic devices utilizing spintronics. In addition, basic scientific research on new magnetic properties in strongly correlated electronic materials and nanomagnetic materials has also been invigorated. In this type of basic research on magnetic properties and research and development on magnetic recording materials, magnetic observation to quantify and detect magnetization direction must be done at high resolution; the spin SEM is thus expected to fulfill a major role in place of the conventional magnetic microscopes. Against this background, in 1984 Kazuyuki Koike developed the world's first spin SEM. This spin SEM utilized the spin polarization of secondary electrons from specimens in magnetic observation. Among numerous devices for magnetic domain observation, it was the only one that made it possible to quantify and detect the magnetization direction of specimens, and because it placed no restrictions on specimen thickness, shape or crystallinity, it could be applied to an extremely broad range of research. Although the spatial resolution of the first device that Prof. Koike developed was 20μm, he has been engaged ever since in R&D and applied research to improve performance centered on consistent high resolution. Major results include the development of a spin detector enabling simultaneous display of the images of two components from a specimen's in-plane magnetization vector; the development of a device with resolution of 0.1μm with application of a magnetic field to specimens possible; the achievement of resolution of 5nm by using spherical deflection electrodes to substantially increase the capture efficiency of secondary electrodes and by further improving the spin detector. Moreover, he succeeded in developing the world's highest-performing spin SEM by making it possible to simultaneously detect three components of the magnetization vector with a spin detector that enables high-speed switching. Also deserving of special mention is the fact that his addition to the above device of a specimen stage that can be cooled to 30K. This addition has made it possible to measure the basic magnetic characteristics of various materials. In parallel with the aforementioned device development, Prof. Koike has been engaged in basic and application research on magnetic materials. In particular, his discovery of multiple closure domain structure and elucidation of ferromagnetic/antiferromagnetic coupling mechanisms and the magnetic structure of magnetic nanoparticle arrays have all been highly praised for their pioneering and original quality. Prof. Koike has also succeeded in proving the utility of the spin SEM in magnetic-property research. Thus, along with developing instruments on the world's highest level that are expected to contribute substantially to ultra-high-density magnetic recording and the development of nanomagnetic materials, Prof. Koike has achieved a variety of outstanding results in his basic and application research on magnetic materials. 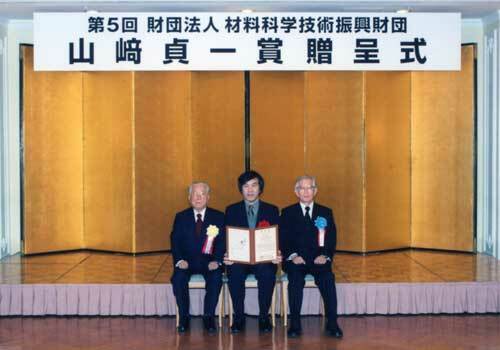 In keeping, Prof. Koike's results were recognized as worthy of the Fifth Yamasaki Teiichi Prize, which he has thus been awarded. In keeping with the advancement of a computerized society, methods for high-speed transfer, processing and storage of voluminous quantities of information are required. Among them, magnetic recording has long been used as a storage method for high-speed recording and playback of vast quantities of information. Research on how to make such recording capable of handling even larger volumes and higher densities is advancing briskly. In addition, in the field of magnetic physics, there is interest in the novel magnetism indicated by ultra-thin films, artificial lattices, nanostructures, and strongly correlated materials, and research with an eye on future industrial applications, including those for spin electronics, is on the rise. To advance such research, high-resolution quantitative magnetic observation will prove indispensable. Magnetic observation methods began in 1931 with the development of the Bitter technique. Although various methods have been developed and practically applied, they are by no means sufficient when considered comprehensively in terms of resolution, quantitative capability, and restrictions on specimens and the like. Thus, the development of new observation methods was desired. Model No. 1 (the world's first, developed in 1984): ○ Resolution: 20μｍ; magnetization vector: detection of one in-plane component of the specimen; simultaneous / separate acquisition of magnetization information and surface concavoconvex information. Model No. 2 (1985): ○ Resolution: 0.2μｍ; magnetization vector: simultaneous detection of two in-plane components of the specimen and vector mapping of in-plane components. ● Surface neel domain walls confirmed in experiments. Cause of noise in hard-disk recording media elucidated. Cause of noise in hard-disk thin-film magnetic heads elucidated. New magnetic structure observed in magnetic/nonmagnetic multilayer film clarified. Multiple closure domain structure of magnetic surfaces with weak perpendicular magnetic anisotropy discovered. Model No. 3 (1988): ○ Resolution: 0.1μｍ; magnetic field application: 450 Oe; specimen temperature: room temperature to 130℃. ● Magnetization process of hard-disk thin-film magnetic heads elucidated. The periodic structure that surface magnetization of thin film with weak perpendicular magnetic anisotropy takes is confirmed in experiments. Model No. 4 (1994): ○ Resolution: 20nm; magnetization vector: Simultaneous detection of two in-plane components of the specimen and detection of perpendicular-to-plane components by development of a spin detector with lens functions. ● Noise source in magnetooptical recording media is elucidated. Noise source in obliquely evaporated magnetic recording tape media is clarified. Noise characteristics of high-density hard disk recording media are analyzed. Ferromagnetic/antiferromagnetic coupling mechanisms are elucidated. Model No. 5 (2000): ○ Resolution: 5nm achieved by reducing working distance through the use of a high-efficiency spin-detector and the development of compact, secondary-electron-collecting electrode. Magnetization vector: Simultaneous detection of three components by turning the spin rotator on and off for each pixel. Specimen temperature: 30K-400K attained through the development of special specimen stage. ● Magnetic structure of strongly correlated magnetic material with perovskite-type layers and a Curie point of around of 100K is elucidated. Magnetic structure of magnetic nanoparticle arrays is elucidated. The outstanding characteristics of the spin-polarized scanning electron microscope (spin SEM) include the following: (i) high resolution, (ii) the ability to quantify and detect magnetization vector direction, (iii) the ability to both separate and simultaneously acquire surface profile images and magnetic images even for specimens that have a 3D surface structure, (iv) wide dynamic range in the observation domain of few mm to several hundreds of nm, with surface crystallinity posing no problem if specimens are metal. Henceforth, the spin SEM is expected to demonstrate major influence as a measuring instrument not only in fields of industrial application for high-density magnetic recording but also in basic fields of magnetism research, such as on novel materials, nanostructures, ultra-thin films, and artificial lattices.